Alpine County is a small gem of a county in the High Sierra. It was created in 1854 out of eastern bits of pre-existing El Dorado, Amador, and Calaveras counties. It includes alpine habitat on both sides of the Sierran crest, but most accessible areas are east of the divide. It is mostly coniferous forests, rocky canyons, montane meadows, and (to the east) sagebrush plains. There is some ranch land in the east but much of the county is National Forest land; the only significant town is Markleeville -- and it is quite small. Grover Hot Springs is a nice resort, Indian Creek Reservoir can be good for waterbirds, and there is spectacular scenery along the Carson River canyon. One reaches the county from the west via one of two high passes (Luther Pass on Hwy 89, Ebbetts Pass on Hwy 4); both are often closed in winter (Ebbetts Pass is always closed in winter). Most year-round access is through the State of Nevada to the east. 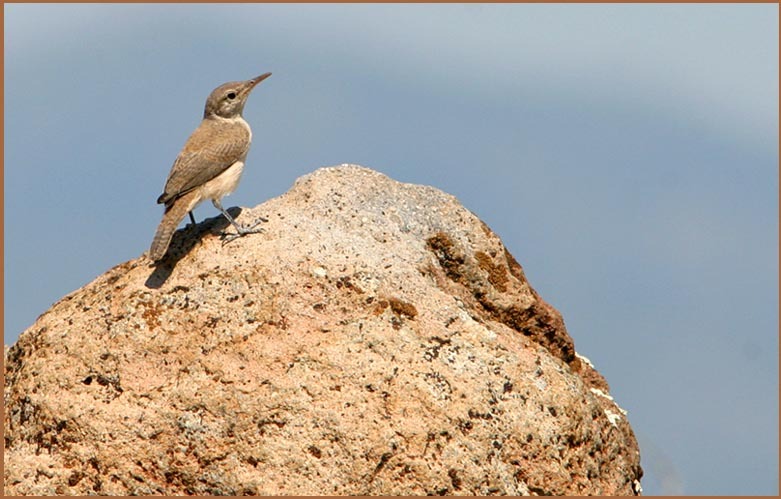 For Alpine County the prime photo is of a young Rock Wren perched atop a volcanic boulder. Beyond is nothing but the open range — typical of the 'open sky' eastern portions of the county. Two shorebirds are featured below. The juvenal Solitary Sandpiper (left) is a rare migrant here (photo'd 14 Aug 2006 at Mud Lake Road wastewater ponds). 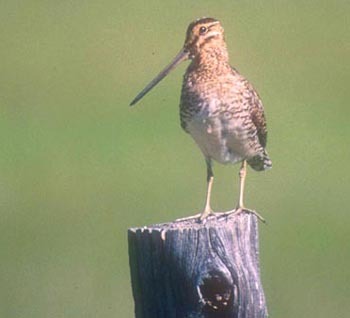 The other (right) is a Wilson's Snipe on territory (20 June 1999). As snipe are very secretive in winter and on migration, it is always astonishing to me to find them standing out in the open during the breeding season.